Guests: Charles Alexander – former LSU All American and All SEC running back, and first round 1979 draft with the Cincinnati Bengals, as well as Coach Johnny Booty, Josh Booty, and Jake Booty. Coming Soon! Guests: New Orleans Voodoo QB Danny Wimprine, Ascension Catholic Head Coach Rick Bolotte, Christian Life Head Coach Keith Dooley with recruits Frank Bartley and Braxton Morgan. Guests: Vermillion Catholic Head Coach Trev Faulk, Zachary High School Receiver’s Coach Greg Williams, Rosepine High School Head Coach Danny Smith, Holy Cross Head Coach Barry Wilson, and Zachary recruits Aaron Simon and Dillon Beard. Coming Soon! 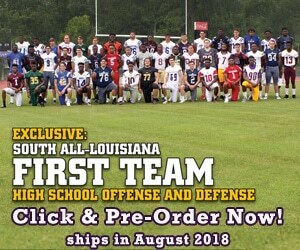 Guests: Denham Springs Head Coach Dru Nettles, St. John Head Coach Barry Musemeche, New Iberia Senior High School Head Coach Rick Hutson, Denham Springs recruit Austin Loupe, Country Day recruit Parker Hufft, and St. John of Plaquemine recruits Nathan Voisin and Da’Vante Williams. Guests: Ruston High School Head Coach Billy Laird, The Advocate Sportswrite Les East, Port Allen High School Head Coach Guy Blanchard with Port Allen Recruit Darian Claiborne, Livonia Head Coach David Brewerton with Livonia Recruit Mark Lewis. Coming Soon! Guests: Nicholls State Legend Kenneth Marshall, Live Oak Head Coach David Dykes with Live Oak recruit Cole Leblanc, and Glen Oaks Head Coach Landry Williams with Glen Oaks recruits Johnta Hebert and Trey Tolliver. Coming Soon! Guests: Silliman Institute Head Coach T.J. Davis, Southern Lab Head Coach Nick Mitchell, Woodlawn (Shreveport) Head Coach DeCarlos Holmes, Silliman recruits Austin Gayle and J.Q. Austin, and Southern Lab recruits Jarrot Thomas and Maurice Aucoin.